Venezuela suffered another widespread power outage on Monday, with authorities claiming a “double attack” against the country’s main hydroelectric dam took place. Both alleged attacks against the Simon Bolivar Hydroelectric Plant, known as the Guri Dam, affected as many as 16 of Venezuela’s 23 states. The first one took place around 1:30 pm on Monday, with Venezuelan authorities denouncing a cyber attack similar to the one they claim caused a major blackout on March 7, targeting the computerized system of the electric grid. While Caracas and other central and eastern areas had power restored and stable within 72 hours, it was not until March 12 that western states Merida and Zulia finally had electricity. However, this time electricity was restored to Caracas within three hours and to the rest of the country after several additional hours when a second alleged attack took place at 9.50 pm. 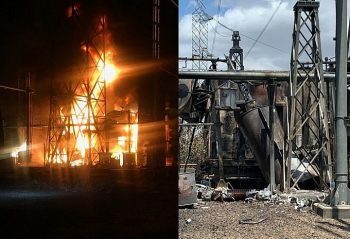 Reports emerged of a fire affecting three transformers in the Guri Dam switchyard, which then took out the San Geronimo high voltage transmission line. “An attack of this nature against the electric system had never been seen,” he added. No further information has been provided as to how the fire was set and who the perpetrators might be, with Attorney General Tarek William Saab announcing that three prosecutors had been assigned to investigate. Three transformers in the Guri Dam switchyard were allegedly set on fire on Monday evening (@jorgerpsuv). The Venezuelan armed forces had held military drills earlier this month with special focus on protecting electricity infrastructure. The Venezuelan government has reported that workers from state electricity company CORPOELEC are working around the clock to restore the damaged transformers, but no estimate of the damage and recovery time are currently known. By Tuesday evening, power had been restored to most of the metropolitan area around Caracas and to some other locations around the country, including parts of the western state of Merida, although with service not yet stabilized. Venezuela’s electrical infrastructure has suffered from underinvestment, lack of maintenance, a brain drain, as well as U.S. sanctions, which have stopped Caracas from importing spare parts and servicing equipment. Recent U.S. sanctions, including an oil embargo, have also generated shortages of fuel which stopped secondary thermoelectric plants from being brought online to ease the burden on the Guri dam during the March 7 outage, the New York Times reported . School and work activities were suspended on Tuesday and Wednesday, with services such as the Caracas metro not yet back in service. There has been no official information regarding the reactivation of water supply, with water pumping representing a significant portion of the country’s electricity demand. At the time of writing there have been no reports of casualties in hospitals or of episodes of violence. The Caracas municipality and the Miranda governorship activated contingency plans for people to be able to return to the suburban metropolitan areas, but many residents were still left to walk miles to get back home. Venezuelan authorities had revealed what they claimed was evidence of involvement of right-wing leaders, including self-proclaimed “Interim President” Juan Guaidó, in a plot to hire foreign paramilitaries to execute targeted killings and acts of sabotage. Guaidó’s chief of staff, Roberto Marrero, was arrested on Thursday and accused of direct links to the mercenaries. Marrero was reportedly presented before a judge on Tuesday morning. Likewise, lawyer Juan Planchart was arrested on Sunday for his alleged participation as a financial intermediary. It remains unclear whether the alleged attacks against the Guri Dam on Monday had any connection to the supposed right-wing plot. For his part, Guaidó accused the government of making up an “imaginary electric war” during a session of the opposition-controlled National Assembly. He also pledged to offer details about “Operation Freedom” on Wednesday, claiming that it will bring an end to “the usurpation.” Concerning the arrests of Marrero and Planchart, Guaidó said they were “direct attacks” against him. Ricardo Vaz is a writer and editor at Venezuelanalysis. His articles have appeared on Investig'Action, Monthly Review, Truthout, Counterpunch, and other alternative media.